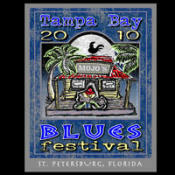 If you love live music like me, the Tampa Bay Blues Festival will be the place to be the weekend of April 9th! The festival takes place in downtown St. Pete&apos;s Vinoy Park, which is the perfect setting. I&apos;m sure the weather will be beautiful for concert-goers to enjoy while sitting along the water listening to the music from over 250 bands and artists including JJ Grey & Mofro (one of my all-time favorite bands and from Florida), Robert Cray and Buddy Guy. You can buy single day tickets or purchase a 3-day pass. The festival promises to be one of the biggest events on the Tampa Bay music scene this year. Tampa Bay Blues Festival has established itself as one of the world&apos;s preeminent blues concerts and attracts blues lovers from all over the country. Don&apos;t miss out on this event! Check back for more upcoming Tampa Bay area events and concerts! There&apos;s always something going on in the Bay area!